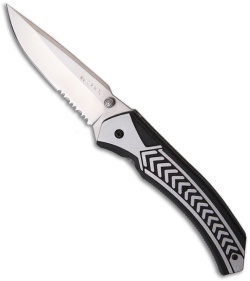 This is the serrated blade version of the CRKT Lift Off. 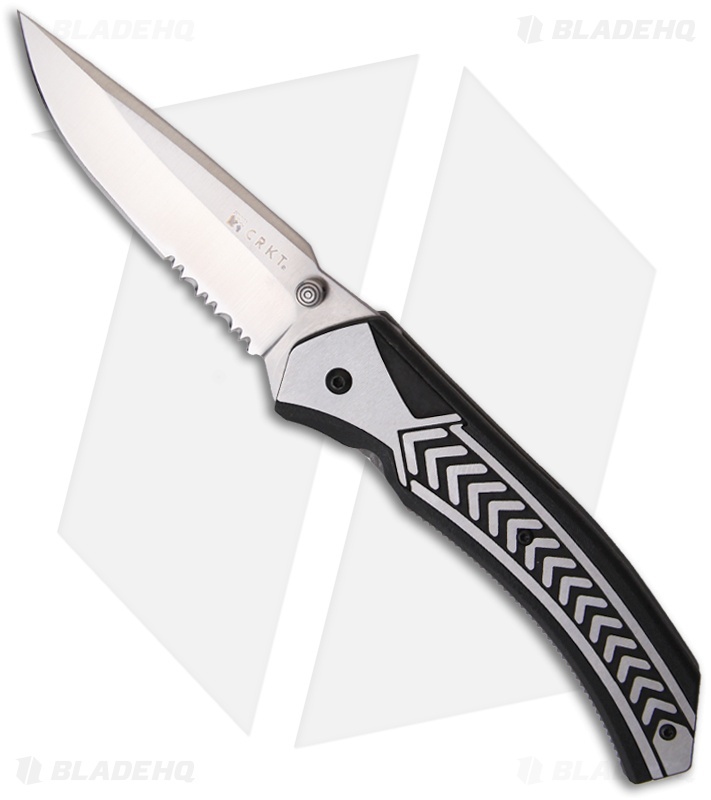 The CRKT Lift Off knife is for those who want a bit of style and shine in their personal carry. 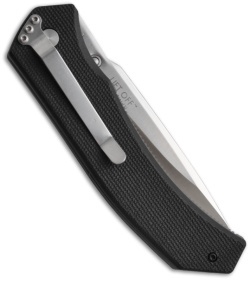 At its core is CRKT's InterFrame build with stainless steel liners, one locking, with textured black Zytel scales. The left scale features a stainless steel insert with a bright brushed finish and deep arrow pattern. In addition, both liners feature fine friction grooves at the finger contact zone. The AUS 8 stainless steel blade is a satin finished modified drop point design with a notched and swedged top edge and a high hollow grind. The Lift Off utilizes CRKT's OutBurst assisted opening with their patent pending Fire Safe mechanism. When closed, the blade is safely locked by the Fire Safe pin. It cannot be opened until the safety button on the end of the thumb stud is firmly depressed and the thumb stud is nudged outward. Just press and nudge for instant lift off. Caution: When closing the knife, always press firmly to fully close the blade, and be sure the Fire Safe pin locks into place securely with an audible "click".